I COULDN'T HELP IT! I saw something BETTER! And something I've dreamed about but didn't think I could have...and as a design buff, I'm ALLOWED to change my mind, right?? It goes with the territory. Behold, my new oversized Chinoiserie lantern!!! This is the loot of the century!!! 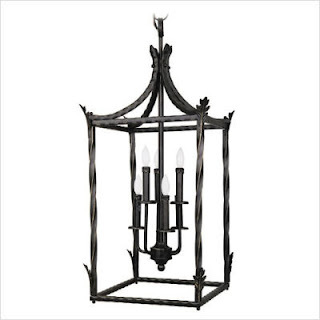 It's a big, gorgeous, oversized Chinoiserie lantern and it's only $120! I KNOW! And then my heart LEAPED when I saw that she had scored them for $120 (and free shipping)! Well, it was one of those things where I just knew this was perfection for my dining room. I wanted a big showstopper piece above the table, and I *think* (having not seen it in person) this will be just the ticket! I (like any Chinoiserie lover) positively drool over bamboo/pagoda lanterns and chandeliers, but they are SOOO pricey, and unfortunately it's hard to score a cheap one as Target and other fine retail establishments tend not to venture into the Chinoiserie territory very often. I've stalked eBay and Craigslist, but nothing (or nothing in my budget). And although I'm sure there are many gorgeous lanterns out there...this one was actually within my reach! Oh VV, I could just hug you for this little gem! D, you didn't have a choice, really. It was out of your hands. . .but doesn't hubby ready the blog? Elise, you are correct. I was powerless. And you would *think* that Carter would read AO daily over his morning coffee, but he doesn't! Can you believe it?! Awesome score! It will all work out beautifully, I'm sure! I just found your blog. I love the design, it's so fresh, fun and sophisticated! Regarding the lantern, I run across this myself and with clients. No money was wasted and here's why: If you were unhappy with the other fixture it was going to be replaced no matter what. The fact that you found this amazing gem at a killer price NOW saved you time, stress and money. Try that angle and good luck! Oh, Acorn (may I call you Acorn? )...I LOVE your philosophy. You are so wise and welcome here any time! Come back soon. you really couldn't afford not to get it. And it's fab. You are ALL so correct...thanks tarheel! Love it, but you could guess that. Knew you would, SR2 :) Thought of you during my little impulsive buying session. Much more appropriate! Great idea :-) There is always room for another chandelier in the house! Just saw your comment on my blog. Thanks! The acorn "name" thing made me lol!!! I'm still tweaking things and probably should think about a photo. Can't wait to see the lantern hung...I'm confident the hubs will love it. Acorn - how could the hubs NOT love it?? Amazing score and I'm sure Carter will forgive you as soon as he sees how excited you are about it! ...And I think I need this for my bathroom!!!!!! oh, if I had a higher ceiling I would put this in my bedroom! What I can't believe is that it is from "TV Stands.com"! I know lr7 - kind of a random place to find it. But the site is part of the online behemoth that is CSN stores - they have about a million sites that I believe all carry the same home-centered inventory under different names. Funny you should ask Miss Sally...because the after pictures are coming in tomorrow's post! OMG I could just kiss you ! I've been looking for one just like this (that wasn't $500) I'm ordering it now !! Thank you ! This is late and I don't know if you look at old comments but I LOVE this and may need one for my breakfast room redo! I can't find it on the TV stands site!! What is it listed under? I need it now! I hate to report that I haven't been able to find it online. I think it was made by a company called "Living Well"...if I come across it, I will let my blog readers know!